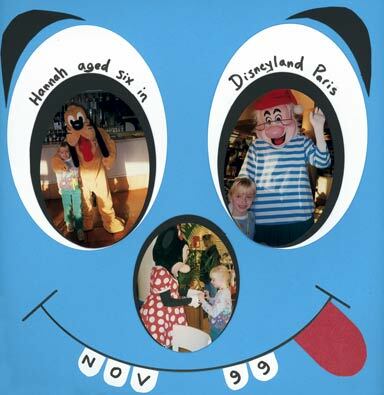 You'll be wanting to top up your Disneyworld scrapbook supply the minute you land - with that huge pile of photos! Fortunately there is more than enough Disneyworld scrapbook supply for you to enjoy. Personally I've only ever been to Disneyland Paris - like Florida but smaller and colder. The photos in this layout were taken with a 'Mickey Mouse' camera, I'm afraid. But I gave it a go anyway! Who says cropping's a 'straight edge' sport?! I used my oval templates here to hopefully create something a little different. I started scrapbooking years after these photos were taken, but it's never too late to rip photos out of those horrible acid-filled sticky photo albums in the attic, crop 'em, and scrap 'em! a) The 'summer blue' background - matching Mr Smee's fashion sense. c) those pearly white teeth! WHY DILUTE THE IMPACT WITH 'OVER-EMBELLISHMENT'? I was tempted to slap the odd Disney Scrapbook sticker on to this layout, but held back on this occasion. If embellishments serve your 'big picture idea' for the layout, then fine. Otherwise it can sometimes be a case of 'less is more'. A SKETCH TEMPLATE - NOT SUCH A GOOFY PLACE TO START! This layout would have taken less dithering time and might have looked better in the end if I'd first got hold of Jen Gormley's '500 Scrapbooking Sketches' . IN fact if you scroll about half way down this page you'll see how she began with a simple line drawn template and ended up with an awesome result. Looking at the pictures I took in Paris with my steam-driven tractor of a camera, this might be a good opportunity to say......BUY A DIGITAL CAMERA!!! (WITH an extended warranty). What scrapping joy I'd have had with my Disneyworld scrapbook supply if I'd only had a decent camera. would grace any Disney or Florida scrapbook. There are excellent Disney page kits available as well as a host of Disney embellishments to give 'free rein' to your Disney Scrapbook Page Ideas. Let your imagination run wild. That's what old Walt did!